Pumpkin Cake or Pumpkin Pie? Yes, Please! Merry Christmas and Happy National Pumpkin Pie Day! Everyone who knows me well generally understands that when I say “I made dessert” what I really mean is “I have made something yummy with chocolate”. Now, my dad, who shares my chocolate addiction love, would never object but my mother and husband are a different story…they constantly request desserts without *gasp* chocolate. Although I think you can never go wrong with a decadent chocolate dessert I have been branching out a bit in order to satisfy the non-chocoholics in the family. Thankfully, the last several years I have developed a taste for all things pumpkin (I know, I feel so grown-up!). Last month I posted a recipe for my favorite go-to muffin, Pumpkin Pecan Pie Muffins, and promised a posting for my favorite Thanksgiving dessert (Pumpkin Pecan Pie) once I was able to rework the recipe to better fit into the paleo/primal lifestyle. My first attempt failed miserably…I had just come off of my Whole 30 and the pie was so sweet I couldn’t even eat it!!! I was determined to get it right for our Christmas dessert but in the meantime I came across another recipe in the December issue of Paleo Magazine that I knew I had to fit into our Christmas menu…Pumpkin Cakes with Pecan Praline Sauce. So, Pumpkin Cakes for Christmas Eve and Pumpkin Pie for Christmas Day…it just doesn’t get much better than that…well, unless you add chocolate! Although this recipe is over-due I’m really happy with the outcome. It is sweet enough to be considered a treat but not so sweet it makes your teeth hurt. The recipe can be made as a simple Pumpkin Pie or amped up into a Pumpkin Pecan Pie by adding the pecan topping…you really can’t go wrong either way. Preheat the oven to 350 degrees F. In a large bowl combine the almond flour, pecan meal, salt, baking soda and spices. In a separate bowl whisk together the coconut oil (or butter), maple syrup (or other sweetener, if using) and vanilla. Mix the wet ingredients into the dry ingredients until thoroughly combined. Press the dough into a 9″ pie pan. Bake for 15 minutes or until golden brown, remove from the oven and cool on a wire rack before filling. Preheat broiler. Combine honey or maple syrup and butter in a small saucepan and cook over medium heat, stirring constantly, until it reaches a low boil. Remove from heat and stir in pecans to coat. 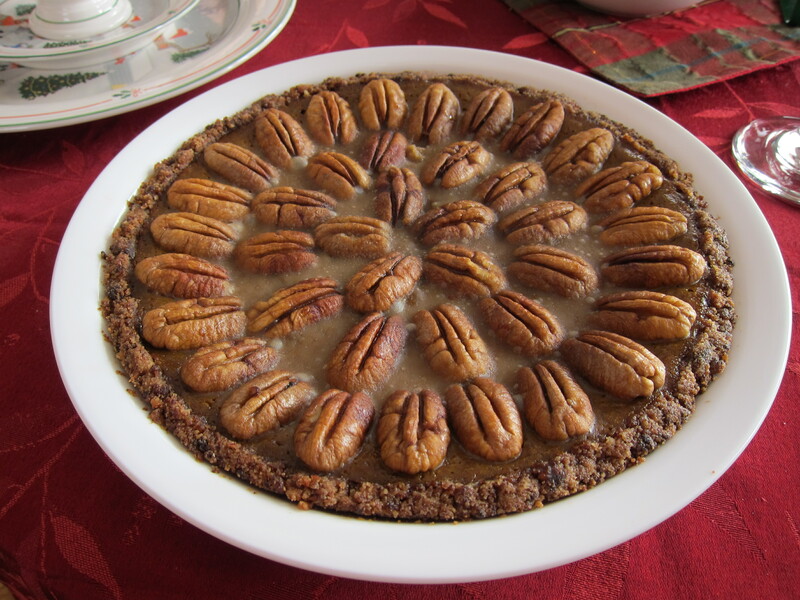 Arrange coated pecans on top of pie and drizzle remaining topping over the pecans. Place under the broiler until bubbly and golden brown, watching carefully, about 2 minutes. Remove from oven to a cooling rack. Cool for 30 minutes before serving or cover and refrigerate. 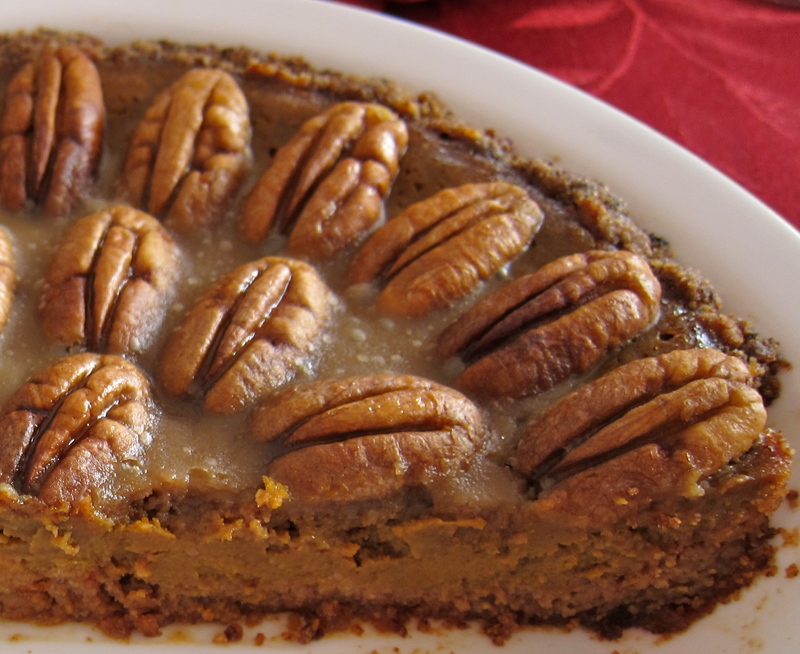 Serve both the Pumpkin or Pumpkin Pecan pies topped with freshly made whipped cream. If you refrigerated the pies bring them to room temperature before serving (or not…some people like their Pumpkin Pie cold! )…about 4 hours on the counter-top. Now…what about those Pumpkin Cakes? 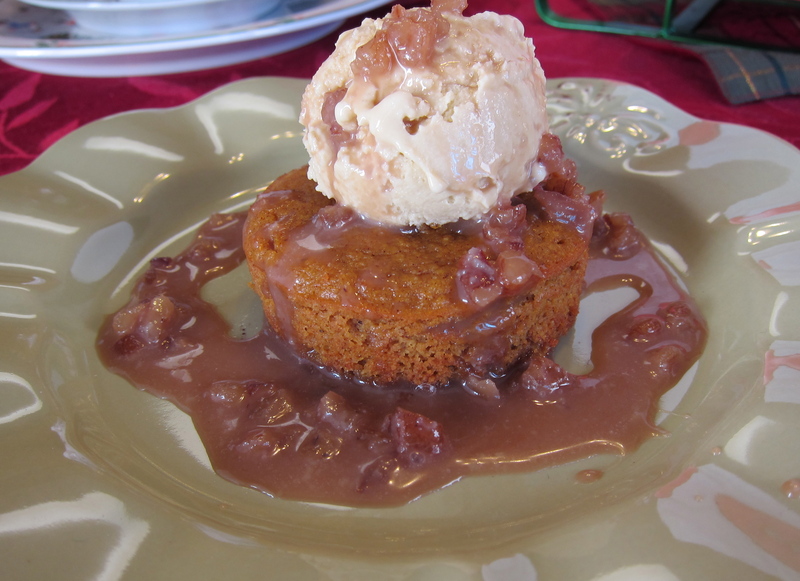 The recipe in Paleo Magazine for Pumpkin Cakes with Pecan Praline caught my eye immediately…I knew this was definitely making the Christmas menu this year! It was delightfully light and ridiculously easy to make. I decided to add a nice small scoop of Maple-Vanilla Ice Cream (dairy-free) to the top of the cake before drizzling the Pecan Praline topping over the whole thing…oh my, it did not disappoint! Here is a picture of our Christmas Eve dessert, check out Paleo Magazine online to download the latest issue, it’s chocked full of great recipes including this one for Pumpkin Cakes. 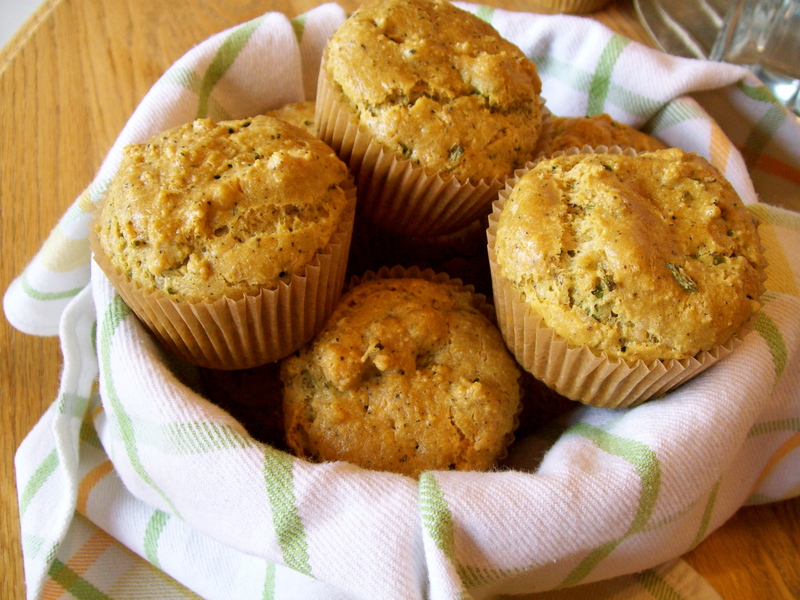 This is a wonderful savory muffin that will be a lovely complement to any holiday meal! Ready to serve up with some grass-fed butter! Preheat oven to 350 degrees. 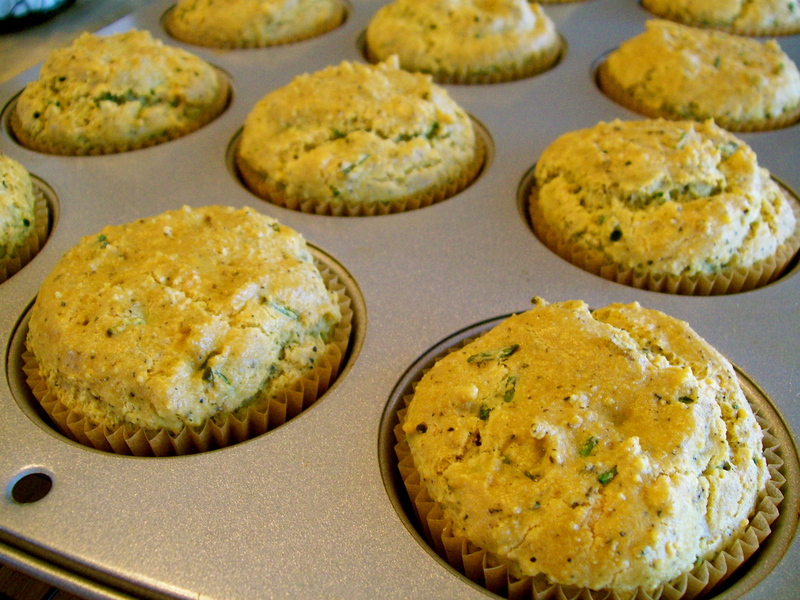 Line a muffin tin with paper liners or lightly grease with coconut oil. In a large mixing bowl combine almond flour, sea salt, baking soda and black pepper, set aside. In a separate bowl whisk together olive oil, eggs and egg whites until frothy. Blend the wet mixture into the dry mixture using a handheld mixer until thoroughly combined, fold in chives and rosemary. Divide evenly between the muffin cups (I use an ice cream scoop or 1/4 cup measuring cup). Bake for 25-30 minutes or until they pass the toothpick test. Remove from oven and cool in the pan on a wire rack for 20 minutes, serve warm with a pat of butter. 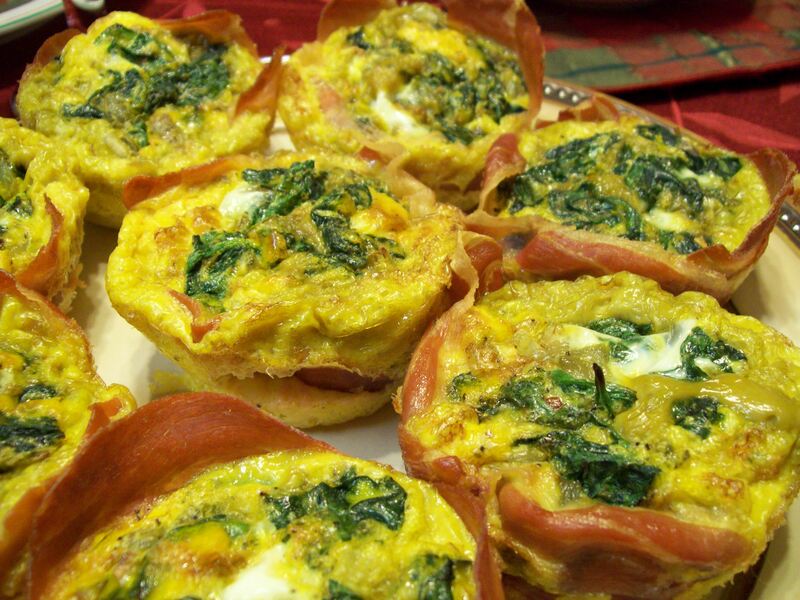 Prosciutto egg cups are an easy grab and go breakfast idea or a lovely main dish served alongside a green salad for a light lunch. They are easily adaptable to your family’s preferences for veggies and you can certainly add cheese to the mix if you include dairy in your diet. I like to bake up a batch of these and freeze them for travel…they give me plenty of protein when I’m on the go and I can even enjoy them at room temperature when I’m on the airplane. Now, you will notice that this recipe uses a combination of whole eggs and egg whites (gasp! )…please don’t misunderstand me here…I LOVE whole eggs and wholeheartedly believe in eating egg yolks but sometimes I like a little bit of a lighter egg dish and I find that this combination works well for me. If you prefer to use whole eggs for the entire recipe…go for it…or you can always save the egg yolks and make some Caramelized Banana Dairy-Free Ice Cream!! Preheat oven to 400 degrees F. Grease bottom and sides of eight ramekins. Line each ramekin with prosciutto (mine took 1.5 pieces to completely cover each one) and set aside. In a bowl, whisk together eggs, egg whites, salt and pepper until frothy, set aside. In a large skillet, heat butter or oil and saute onions and mushrooms until tender. Add the spinach and stir until just wilted making sure the veggies are all mixed together. Add a pinch of salt and some pepper, if desired. Divide the veggie mixture evenly into the ramekins and press down so that they are tightly pressed in the ramekin. Divide whisked eggs evenly into the ramekins (I found that each one holds about 6 Tbsp of egg mixture). Place all of the ramekins on a cookie sheet and bake in the oven for 20 minutes or until eggs are set in the middle. Remove from oven and let rest for 5 minutes. Pop the egg cups out of the ramekin and enjoy!